Even if you’ve been sweeping your stamped concrete regularly, you’ll want to start your cleaning session by sweeping it. The broom will help remove any loose dirt and debris from the concrete and lets you start with a clear surface. If you’re prepping outdoor stamped concrete for cleaning, you can also use a leaf blower to clear away loose debris. After you’ve swept away loose debris, you can use a wet mop, like a foam mop or a rope mop, and a bucket of warm water to clean your stamped concrete. Rinse the mop regularly throughout the process and change the water if needed. A thorough mopping like this is usually sufficient to clean stamped concrete. If your stamped concrete has obtained some stains and cleaning with just water is not enough, you can try mixing a non-abrasive mild cleanser into your water and mopping with that. A mild laundry detergent, dish soap, or another mild detergent can help create an effective cleaning solution that will help remove most stains and dirt from your stamped concrete. There are even cleaners that are specially formulated for use on concrete that you can use. Make sure you avoid harsh chemical-based cleaners; these types of cleaners can dull the surface of your stamped concrete over time and erode the protective sealant. Can You Pressure Wash Stamped Concrete? Yes. If a mild detergent solution is not effective in removing tough stains from your stamped concrete, you can use a pressure washer to help remove them. A pressure washer is usually helpful in removing stains from leaves, grease spots, or tire marks. How do You Remove Oil From Stamped Concrete? A good sealant with a silicone base can help reduce oil stains from forming, but if one occurs, there are a few things you can do. If you catch it while the oil is still liquid, you’ll likely be able to remove it with a mild grease-cutting dish detergent. Start by applying the detergent to the oil stain. Then, use warm water to soak the oil stain and the surrounding area. Keep paper towels, cat litter, or sawdust nearby to soak up the solution and scrub the center of the stain with a nylon bristle brush. You may be tempted to use a wire brush, but a wire brush could scratch the surface of your concrete and leave it vulnerable. Once everything is cleaned up, dispose of the oily papers, sawdust, or litter in a safe landfill site. If you don’t know where your local one is, you can contact your municipal public works department for help. If you’re dealing with dried-on oil stains, you can try a grease-cutting dish detergent mixed with hot water and following the steps for a liquid stain. This may be enough to lift the stain out. But, if it’s not, you can use a cleaning solution with an alkaline degreaser to help remove it. Each degreaser may have slightly different instructions and best ways to use it, so it’s important to follow the instructions on the label. This will help you remove the oil stain and avoid any potential damage to your concrete. 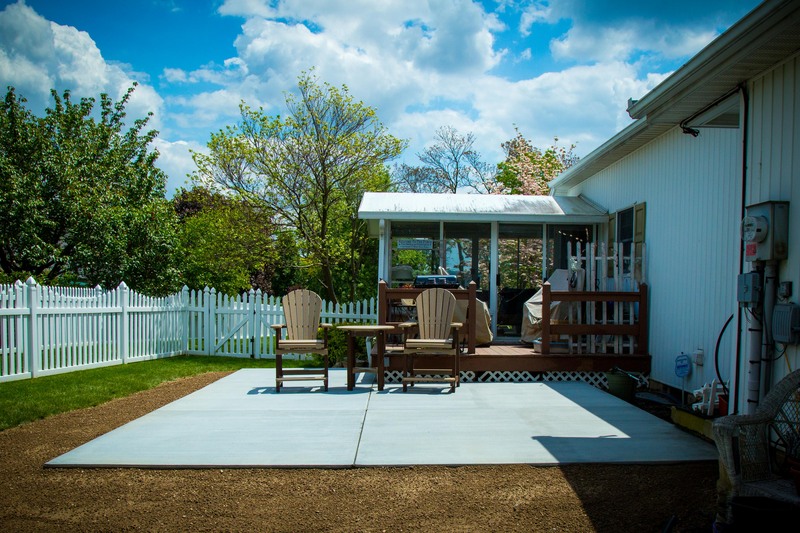 Stamped concrete is a low-maintenance surface material and, with these cleaning tips, keeping yours looking beautiful is a breeze! 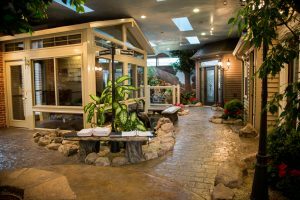 If you’re considering adding stamped concrete to your home, contact Zephyr Thomas at 717-399-4708 or stop by our showroom to get inspired!